Note: Please go to the River Community Official Plan Amendment page for the most recent privately initiated proposal on these lands. 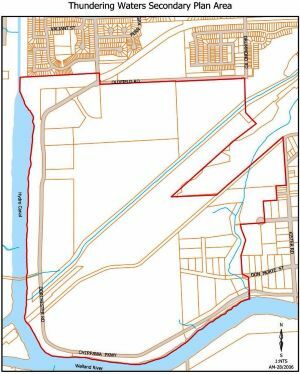 The City has initiated a Secondary Plan process for the Thundering Waters area north of the Welland River, east of the Hydro Canal, south of the Hydro Corridors and west of the Thundering Waters Golf Course and the Stanley Avenue Business Park (see Plan). The Secondary Plan is a land use, transportation and servicing policy plan for a sub-area of a city. It details how the policies and land use designations of the Official Plan are to be implemented. The Thundering Waters Secondary Plan, when completed, will be approved under the Planning Act as an amendment to the Official Plan. This open house was held to inform the public of the studies that had been completed to date and to receive public comment. You can follow the link to view the poster boards. Preceding the open house, City Council endorsed the draft principles and objectives and received submissions from the public. The developer, GR (CAN) Investments Ltd. also made a presentation. obtain input, views and comments. You can visit the Open House Presentation link to see the information displayed at the Open House including more details on process, public consultation and the studies required for the Secondary Plan.